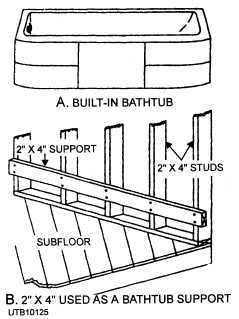 Home > Construction Training Manuals > Utilitiesman Volume 01 > Figure 5-23.Bathtub And Support. Figure 5-23. - Bathtub and support. To install a tub, like the type shown in view A, figure 5-23, place the rim of the tub on the 2- by 4-inch support nailed to the 2- by 4-inch studs, as shown in view B, figure 5-23. Check to be sure the tub is level. 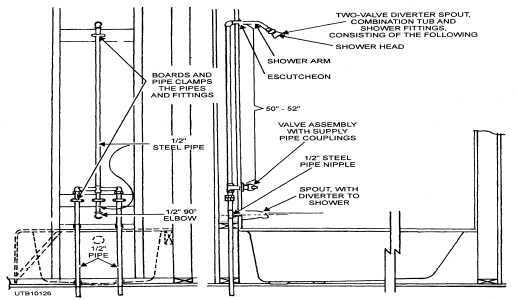 Once the tub is in place, hook up the water-supply lines, as shown in figure 5-24. Now you have a bathtub and shower combination. Water is furnished by a faucet and spray nozzle. Two valves usually control the flow of water to these units. Ordinarily, when the valves are opened, the water runs into the bathtub from the bathtub faucet. However, for water to run through the shower head, the valves are opened as for filling the bathtub; the diverter which is located in the bathtub faucet must be raised. This combination gives the bather two means of taking a bath. A tub drain and overflow are usually similar to that shown in figure 5-25. The drain assembly is installed in the space provided by the studs at the end of the tub. The overflow and waste drains are made of chrome. The hidden parts are of rough brass and brass tubing. The fittings are 1 l/2 inches in diameter and come with a pop-up waste or a rubber stopper fastened to the overflow by a chrome chain. This drain and overflow combination is connected to the P trap with slip-joint nuts and rubber washers to seal off the leaks. The drain in the bottom of the tub is sealed against leaks with plumber's putty and rubber rings. Figure 5-24. - Bathtub and shower piping combination.